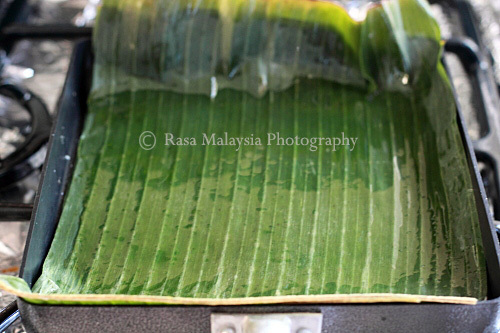 Malaysian grilled fish wrapped with banana leaves. Moist, aromatic, spicy, and full of flavor. The best grilled fish recipe ever! Prepare the sambal by grinding chilies, shallots, belacan and lemongrass in a food processor. Make sure the sambal paste is well blended and smooth. Heat up a wok and “tumis” (stir-fry) the sambal paste until aromatic or when the oil separates from the sambal paste. Add the seasonings: salt, sugar, and fish sauce and do a quick stir, dish out and set aside. Soak the tamarind pulp with water for 15 minutes and extract the juice. In a mortar and pestle or food processor, pound/blend the red chilies, bird’s eye chilies, and toasted belacan. Add tamarind juice, sugar, salt, and sliced shallots to the sambal. Stir well and set aside. Grease a flat pan (I used a Japanese tamagoyaki pan) and then lay a few sheets of banana leaves in the pan. Add 1 tablespoon of cooking oil on top of the banana leaves and spread the oil evenly. 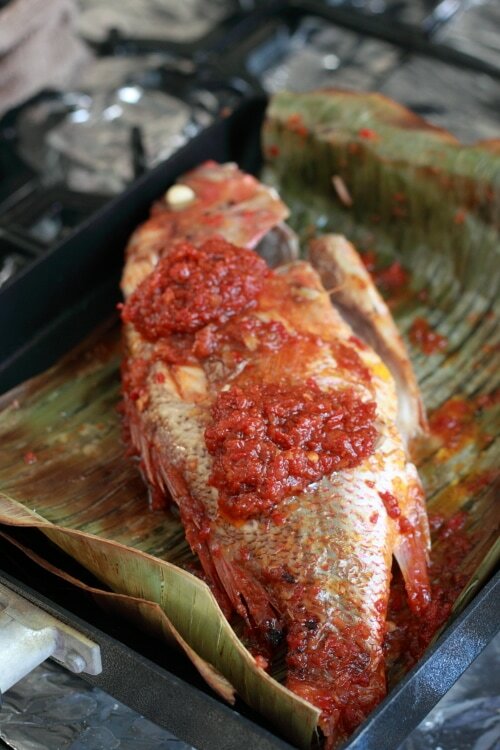 Lay the fish on top of the banana leaves and add 3 tablespoons of sambal on top of the fish. Heat up the pan on your stove top over medium heat and cover it with a lid. (Use a towel to cover the corners of the pan in case the lid is too small to completely cover the pan. This will ensure the heat traps inside the pan during the grilling process.) Wait for 8 minutes or so and flip the fish over to the other side. Add 3 more tablespoons of sambal on the other side. Cook for another 8 minutes or so. By then, you can smell the sweet aroma of burnt banana leaves and grilled fish. Dish out and serve immediately with sambal belacan and sliced shallots condiment. This is the grilled fish recipe that I am reluctant to share. Why? Because it’s so darn good and perfect. I secretly wanted to stash my hand written Malaysian grilled fish recipe somewhere and hoping that one day, a mega chef like Jean-Georges Vongerichten would pay me $10,000 for this precious recipe. But I am a nice person; I love sharing all the good things in life with others. In fact, sharing is an infectious virtue of mine–it brings bright smiles to my face when others share my joy, and in this case, great taste. I had a grilled fish recipe in my archive, but that one wasn’t as good. The sambal topping was exquisite –spicy, aromatic, pungent, salty, sweet, and well-balanced. I examined it closely with my eyes and taste buds and tried to deconstruct what went in there and I think I might have gotten it, or at least, very close to it. I also figured out a way to grill fish using my all-American stove top with the smell, taste, and authenticity triumph the ones served by some of the best Malay ikan bakar stalls in Malaysia. I really urge you to try this grilled fish recipe and have put together a step-by-step picture guide in the gallery above for your easy reference. I think my late grandmother and parents would have been so proud of me had they tasted my grilled fish with banana leaf. Enjoy! Heat up a wok and "tumis" (stir-fry) the sambal paste until aromatic or when the oil separates from the sambal paste. Add the seasonings: salt, sugar, and fish sauce and do a quick stir, dish out and set aside. Grease a flat pan (I used a Japanese tamagoyaki pan) and then lay a few sheets of banana leaves in the pan. Add 1 tablespoon of cooking oil on top of the banana leaves and spread the oil evenly. 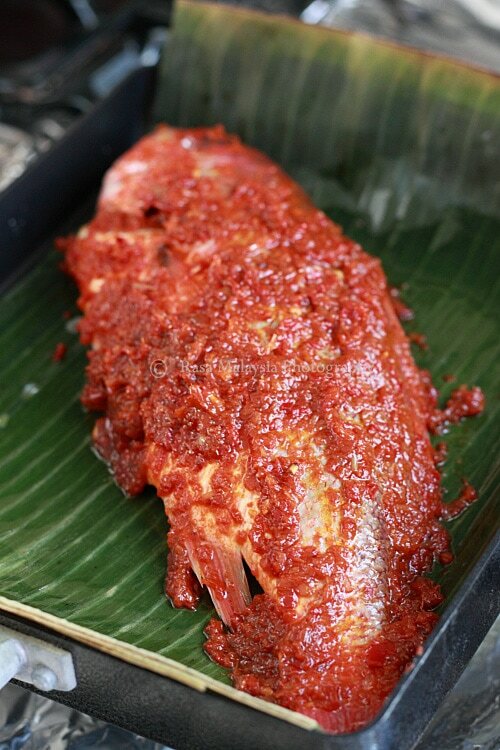 Lay the fish on top of the banana leaves and add 3 tablespoons of sambal on top of the fish. Heat up the pan on your stove top over medium heat and cover it with a lid. 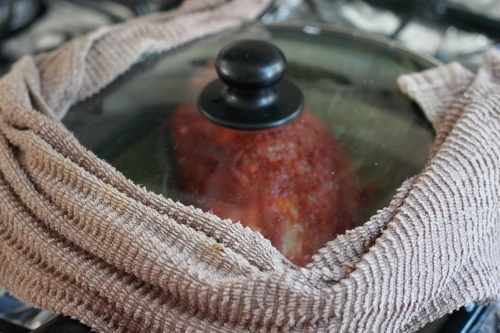 (Use a towel to cover the corners of the pan in case the lid is too small to completely cover the pan. This will ensure the heat traps inside the pan during the grilling process.) Wait for 8 minutes or so and flip the fish over to the other side. Add 3 more tablespoons of sambal on the other side. Cook for another 8 minutes or so. By then, you can smell the sweet aroma of burnt banana leaves and grilled fish. Dish out and serve immediately with sambal belacan and sliced shallots condiment. you just made me miss home 10 times more!! great food great picture!! i cant really cook.. but ur inspiring me to! I might try one of these tomorrow! thank you!! Suyen – nothing beats the grilled fish back home in Malaysia! sounds great! can you use a wok instead of a tamagoyaki pan? what difference would the pan make? Yes, you can use a wok, it works the same but a flat pan like tamagoyaki pans works easier since it’s flat. This is my favourite – like it especially with sting ray!! Back home, there’s one Malay stall near where I live is famous for ikan bakar!! Malay ikan bakar is the best! They really know how to grill fish and make killer sambal. Bee, I will give you a hug for being so generous! This looks beautiful! I have to try it at home soon! commonly found in KL nowadays. even in food courts. the slightly sour-ish sauce is really lipsmacking stuff. esp if they grill them with okra, petai, or even sotong! 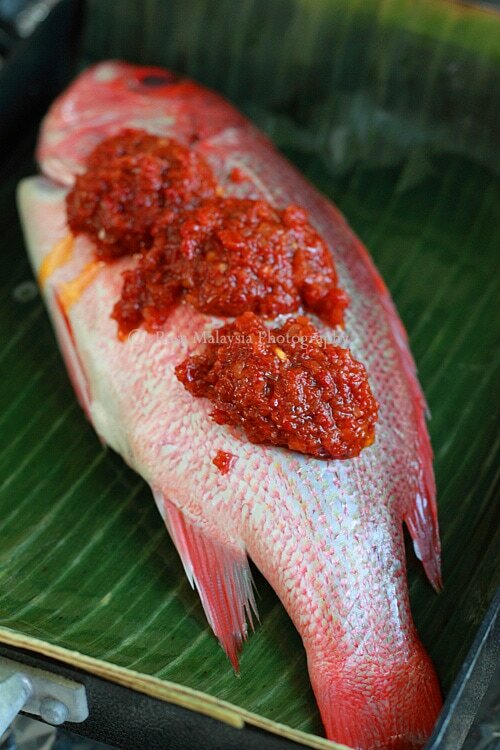 i love sambal (just cooked sambal petai last nite) & i love snapper! since i was a kid, my dad has been fishing as a hobby & often brought back kilos of snappers. saved us a lot of $ buying fish in the market back then. the way you’ve grilled this look so mouth-watering. would go really well with cincaluk sauce too. Nyonya Pendek – cincaluk sauce, how did I forget that one. Great idea. Looooove cincaluk sauce! Thanks for reminding me. yummy, yummyy .. the grill fish looks very authentic and upon reading the recipe, I know that this is a killer recipe. Thanks for sharing :-) You´ve done it again. Ahhhhh….. looks soooo good. Any ideas on where I might find banana leaves in NYC? Do they come frozen? Yes, they are frozen, look in the frozen section of your Asian store. Or you can move to Hawaii where you can open up a specialty restaurant selling grilled fish. You can get banana leaves straight off the banana trees. This looks as amazing as you have described it! Thanks for sharing the recipe with us…I’ve already saved it :) Great for those of us without a grill! 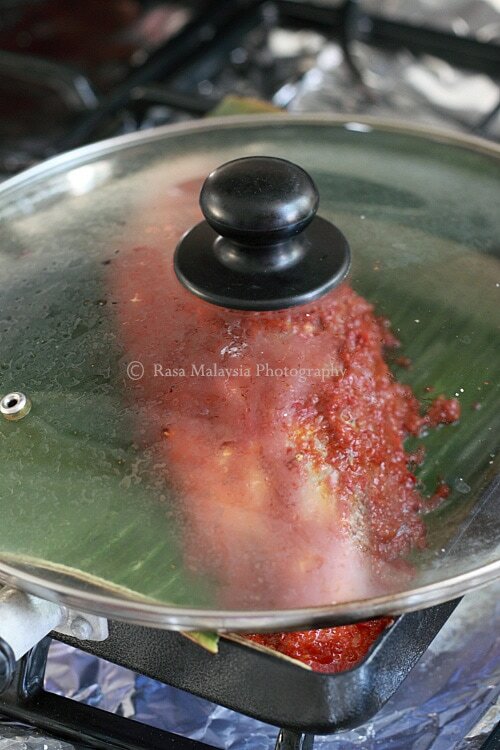 Bee, You’d mentioned grilling the banana leaf fish stove top and this is a fabulously clever method! I was thinking that you’d wrapped up the fish and placed it atop the grate directly on the flame but that would have been one big mess. So if I were to grill the fish, would I wrap it in banana leaf and then put the packet on a medium-hot gas/charcoal grill? I think the cooking time would be a few minutes less. Andrea, I tried it on gas grill during my Foodbuzz party last weekend, but I wrapped the fish with banana leaves and then with aluminum foil. The problem with my gas grill method was that the steam was trapped inside the fish and it became watery, and hence diluted the sambal, which wasn’t good, plus there was no burnt banana leaves aroma. The following day, I tried it over my stove top using the method in this recipe and it was perfect. If you wanted to use gas grill or charcoal grill, I would suggest still using a pan like I did. In Malaysia, all the “ikan bakar” hawkers grill their fish with a big flat pan, and then they lay banana leaves on top of the pan and beneath the fish…but not directly over fire. In my previous recipe, I did wrap up the fish with banana leaves and then secured it with tooth picks, and then grill over low fire. You have to watch the fire and ideally get a thin piece of fish fillet to make sure it’s cooked fast, so the banana leaves don’t get over burnt. Good luck trying!! This looks delicious! 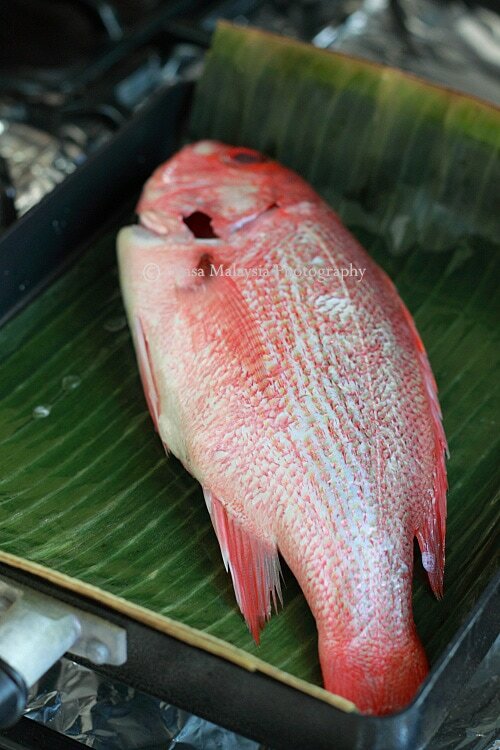 Can you recommend other fish I could substitute with as red snapper is not sustainable in my area? I have my eyes stuck on that photo of yours. I would drive all the way to have that grilled fish, it just looks so tempting…moist and not over burnt. CK, the one I went to is the ikan bakar behind Parkroyal hotel. The two stalls at night. I made one of Pepy’s steamed fish dishes the other day and it was so good. I’ve bookmarked your to give it a try sometime. I loved grilled fish as much as I love baked fish! Served Asian-style, I often serve it with rice vermicelli Chinese-style or in rice paper rolls Vietnamese-style. 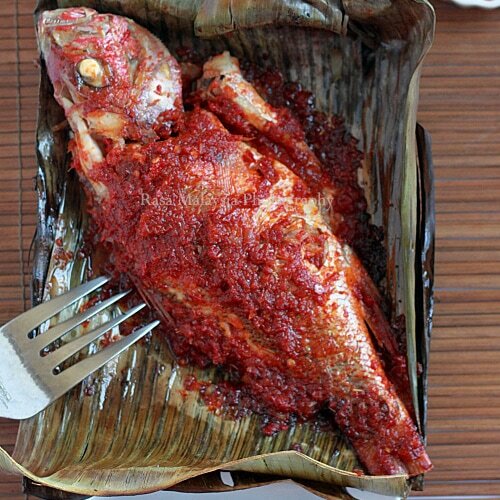 I am not that very fond of fish, but this picture of spicy grilled fish just looks so mouthwatering…! I just linked your site to mine if you don’t mind. never tried this kind of grilling before but it sure looks yummy.here in the philippines we usually put some stuffing inside the fish like chopped shallots and tomatoes and other spices. The fish looks absolutely fantastic. I have to bookmark this and try your method… I don’t have the pan that you use. Do you think the cast iron grill will do (the one that covers 2 stove top burners )? BTW, your summer white party looks very nice. Thanks for sharing the recipe and ingenious method. Absolutely stunning. I’ll have to give this a try the next time my parents visit. They’re the only ones who will eat fish with me. My wife and daughters only like the deep fried in batter (Like the British) type of fish. LOL! The ladies of your house prefer fish and chips. Looks divine Bee. Really moist and the sambal must be so aromatic. Syrie – you have no idea. Soooo good! Did u use frozen banana leaves? I haven’t tried them before cause they are so expensive. Seemed too wasteful, if not nice. That fish looks amazing. I want it in my mouth now. You can’t get to taste it even if you lick your monitor screen. I shoudn’t have finished my portion of the steak that day. Until now im still thinking of the stuff tht i could’nt eat because i was too full. lol. Thanks for sharing this recipe. I have been craving for it since my recent Penang trip. Will make it tomorrow. Ellie – let me know how it goes. I also wanted to say i LOVE your site! Ever since moving to London, I’ve been looking for recipes for all the food i took for granted as being readily available when I was living in NYC. Your photos are amazing and everytime I see one of your posts, I know what I want to have for dinner that night. :))) Keep up the amazing work! Your ikan bakar looks good! :-) I’m game anytime for this food! The dish looks ok but the best ikan bakar is still in Malacca. Not sure about that because I have never tried ikan bakar in Melaka. Ikan bakar in Melaka is overated, bland, overpriced and not tasteful enough for my taste. This one is quite similar to Kelantanese version of ikan bakar. kamil, i guess you went to the wrong ikan bakar spot. you should go for ikan bakar hj musa, sg duyong, melaka. UNLESS you still opt for a much sweeter-taste food as any Kelantanese would, you wont find it delicious. I just want to say thank you for sharing the recipe. I made it yesterday and it was so very good. The grill/smoke aroma reminds me of ikan bakar in Malaysia. The one thing that would make it even more perfect is the sambal balachan– can’t find calamansi lime here :( Grilling on stove top is a really great idea, now I can make this dish in raining winter time too! Btw, do you have a good recipe for acar (pickled vegetables and peppers stuffed with shredded green papaya)?… looking forward to more mouth watering food photos from you. Yes, to me calamansi makes the difference in my sambal. That’s why you see I cannot contained my excitement finally finding them in the store here :) Stay tuned here or over at nyonyafood.com. I may just have an acar recipe worked out in the future. Absolutely love your site. Tried a few recipes so far, the anchovies nasi lemak was the best ! just wondering the red chilli you mentioned in the sambal paste is dried/fresh?Prob a silly question but i can’t even tell the difference between onion and shallots 6 months ago! This is the first recipe I tried from your site. I can say that dinner tonight was awesome! I used the the hot plate on the bbq and it worked very well. I had a lid that fit over the whole fish too. Used some green and red chillies I had in the freezer so the paste didn’t look as red as the pics here. The flavour really reminded me of those open air restaurants back in Sarawak. This is the closest thing you can get to that. What kind of red chillies did you use? I used about 3 oz and that was spicy enough. Thanks for sharing! Will try it with sting ray next time. RobNZ – glad you love the grilled fish recipe. Yes, it’s very good and I am going to make it today for friends. Just tried this recipe at home. The taste is so authentic, it reminds me of home. For those of you who haven’t had a chance to try it, TRY IT! You’ll not regret the time and effort spent to make this wonderful dish. This recipe is definitely a keeper! Omg this looks so freaking delicious, drooling =p~ ,How would this compare to petaling street grill fish? I found your blog totally awesome and want to try the above recipe. Just a small doubt. Hope you can clarify it. Can I use sauteed shrimp paste? Yes, you can, but be prepared of the pungent smell. Do I have to soften the banana leaves with hot water, otherwise the leaves will break easily. Also can I use an oven grill. Thanks. Yes, you can rinse the banana leaves with water and wipe it dry. You can use an oven grill, just flip the fish over to bake evenly. Lime juice is usually added AFTER the sambal is done and stirred slightly to mix. Hi Bee, tried this for dinner last night. The smell was indeed pungent, burn candles certainly helps. I tried this with a sockeye salmon on a grill pan. It turned out delicious! Not sure why you did not recommend salmon. Happy cooking! Amelie – I actually think salmon is too dry for this recipe. But it’s personal preference. Thanks for being so nice to share your recipe! Thanks for being honest about your reluctance hehe I was grinning when I read that part. Your sharing certainly blesses us all. I am in Melbourne and yes cannot find good sambal paste to use. I crave those foods from Singapore where I come from. And the instant pastes we find in shops use either palm oil or MSGs so I dislike buying them. I found stingray at our local fish shop recently. I would love to try your recipe. Thank you! I m too a recipie craze……thanks for this site…. Thanks for sharing this recipe. I tried it yesterday and it turned out amazing! Will definitely cook it again. Hi can I know how many Chillies and shallots are we looking at in 6oz and 4oz respectively? Thank u. Can this sambal be made without belachan. My family do not like belachan and what can I use as substitute. Thanks.